Entrada 10€ C/ Oferta de CD Promo. 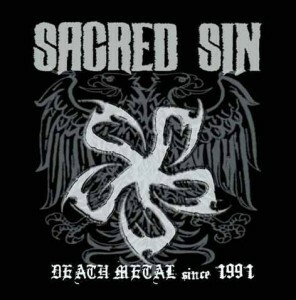 …Thrash/Death Metal legends from Portugal, SACRED SIN, was formed in the summer of ’91, in October ’91 the band recorded their first tape. In September ’92 the band recorded 4 new tracks for a 7″EP out on Slime Rec. (Portugal), and Wild Rags Rec. (U.S.A.) on tape. In ’92 they start touring activity. In the spring of ’93 and due to the interest of Musica Alternativa the band entered Edit studios with producer Jorge Adonis and recorded the fabulous album “DARKSIDE”. The reaction of both public and critics was unanimous in claiming this as the best death metal album ever released by a Portuguese band. The band has also played some tour dates as support act for NAPALM DEATH and MANOWAR and were invited to play at “HEADBANGERS Ball Video Road Show”. The “DARKSIDE” video has also been featured on MTV-HEADBANGERS BALL (they were the first and only Portuguese band to have a video played on MTV at the time) and it was also played on MTV – Brazil and TELEJONICA – Italy. In April ..95 the band went into the studio again to record the follow-up, to be released by Dinamo / BMG Ariola on November, entitled “Eye M God” it’s much more powerful and better produced than the early material. During June they support TIAMAT, SAMAEL & SENTENCED. To promote the new album they toured Europe during December supporting MALEVOLENT CREATION, and VADER which began after the gig in Portugal supporting THERAPY ?. From this album they made the video for the titletrack “Eye M God” that has been featuring at MTV..s Headbangers Ball and at VIVA..s Metalla. In June ’98 the band sign a deal with Uniao Lisboa / Farol, and they go to Exit studio to record «Anguish I Harvest». This album is licensed to UK label Dream Catcher for European distribution and is released in February..’99. In March the band starts touring activities in Portugal, and supported ENTOMBED in April. In June the tour follows in Spain and more shows in Portugal. In the Summer the band appears at some major Festival in their country with bands like MANOWAR, NAPALM DEATH, PARADISE LOST, etc. During November they join PRIMORDIAL for a tour in Portugal and Spain to finish a year of intense touring. In June 2000 they come back for more shows in Portugal, Spain and Belgium. For the Halloween 2000 the band goes back on the road for the 2nd part of «Anguish the Tour», playing more shows in Portugal, Spain, Belgium and Germany . In November the band signed with UK label DEMOLITION Records, and in December start the recordings at their own new studio the “13th Cave”. The album intituled «TRANSLUCID DREAM MIRROR» is released on the 9th of April 2000. This album was undoughtly controverse as the band progressed a lot into different styles, but it represents a big step forward on the way the music is made. 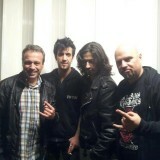 Since October 2001, the band has a new drummer, Rolando Barros. With him the band toured in Belgium, France, Spain and Portugal during November to promote the latest release «Translucid dream mirror».In the beginning of 2002 the band was writing new songs. Meanwhile, and celebrating a decade of extreme metal releases, is coming out in October a limited edition compilation CD intituled «Mastery of holy imperial art – a decade of extreme metal music 92 – 02» . The track list includes all of Satans favourites songs, re-mastered versions, plus additional cover versions from MORBID ANGEL, VENOM, DARK ANGEL and SLAYER. This release was licensed to BLACKENED MOON Productions (USA), and RESOUND Records (Austria) is putting out in MC format. The new album, the fifth full length release so far, was recorded during March and April , again at the 13th Cave, the bands own studio, the mixing took place during Summer. This new album, intituled «Hekatón – the return to primordial chaos» is inspired in the myths and legends of Atlantis. It’s the fastest and most brutal release from the band so far. Reviews for this, the bands second release on Demolition, have been the best yet, with Germanys Rock Hard giving them a 8/10 and international reviews in general being 8/10 or higher. Touring from October to December 2005 in Portugal, Spain, France, Germany, Belgium to promote this release. SACRED SIN is back in 2006, recording during September new release “Dawn Over Desolation” , announced for early 2007, with the band hitting the stages in Portugal and Spain for celebration of 15 years of extreme metal mastery. .. New album «Dawn Over Desolation» is released under Nemesis Productions, including 6 songs: «Dawn Over Desolation», «Spellborn Rotten», «Darkside MMVII A.D.» (new version from the brutal classic), «A Monestary In Darkness / The Shades Behind» (new version), «Thou Art Revenge», and «Abominations» (Morbid Angel cover). .. .. After a break of few months, due to personnal reasons and health problems, the band is working on new songs for recording at the 13th cave, the bands home-studio. No hurries as usual, the aim is to get the best out of the new songs keeping the old-school Thrash/Death as brutal and intense as possible! 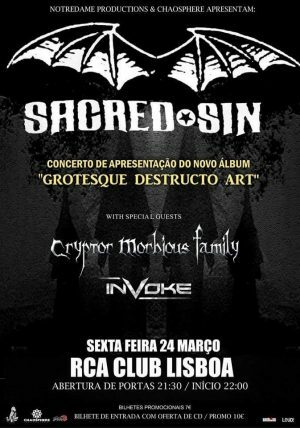 Also the band decided to make this year the last for Sacred Sin as «active» live band. These will be their last shows, as tribute to the fans and friends, a last goodbye & thanks to all for the support! . Cryptor Morbious Family is a Portuguese industrial-metal band from Grândola, Portugal. The first songs and ideas around CMF began in 2002 with Carlos Sobral (drums), Carlos “Bixo” and Victor Escalona (guitars), and César Palma (bass). After two years spent on a garage composing, the project was putted on hold. In April of 2005, Maldito, Escalona and César announced officially CMF (while Bixo focused on his own band “Seven Stitches”). 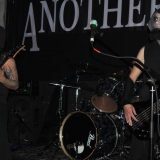 In June the line-up was completed with Tiago Tokinha (vocals) and Márcio Manuel (bass), and the debut show was on August, 14. 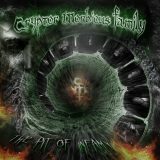 In November, CMF released their debut album “All of us got a killer inside”. Escalona left the band during the recording process and was replaced by the live guitarist Duarte Faria. CMF gained a good fan base due to their powerful shows, and the single “Painful Rebirth” gained some airplay. The debut album had a 28 date tour. In 2009 CMF was a known name on the underground Portuguese metal scene, and their 2nd album “Hypnotic way to hurt” was received well. Márcio left the band during the recording process and was replaced by John Pika. The album had three versions; the self-released version in 2009, and the 2010´s American version by “Beneath the fog productions” and European version by “Ziekte Records”. Two singles were spawned; “Straight To The Doom” and Collective Syndrome”. The tour had 35 dates. Pika left the band in early 2010 and was replaced by Escalona as live bassist for some dates, later Vitor Fava became the permanent bassist and another guitarist was added; João Português. After the “HWTH” tour ended, CMF began planning demos for a new album but Português and Fava moved from Portugal so CMF decided to take some time off. 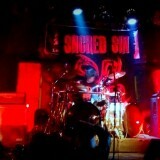 In 2013, the ep “Saint Eyes Hide Revenge” was self-released and without touring support. The EP contains b-sides, plus a version by Daniel Erlandsson (Arch Enemy) and a previously unreleased song. After a year off, the band reunited again and began working on their 3rd album. After several delays the album was finally recorded and released in January 2017. As raízes deste projecto remontam ao ano de 1996. Depois de alguns anos de instabilidade, com a saída e entrada de muito membros, os Invoke conseguiram, por fim, encontrar a formação sólida e ideal. Contando com o input criativo de Reborn, nas guitarras, vozes e sintetização, com o contibuto avassalador de Anonymous God no baixo, com a tarefa de fazer segundas vozes e programação e por fim, com a velocidade de Animosity na bateria. A banda atingiu, por fim, o seu estado perfeito. A representação das três esferas concêntricas do Universo: natural, humano e divino. Os Invoke estão desta forma, a conceber um projecto com influências de um black/death metal, com contornos melódicos e atmosféricos.